PGIM and Hanover bought a 29-story residential tower near Hermann Park. Photo credit: Ralph Bivins, Realty News Report. 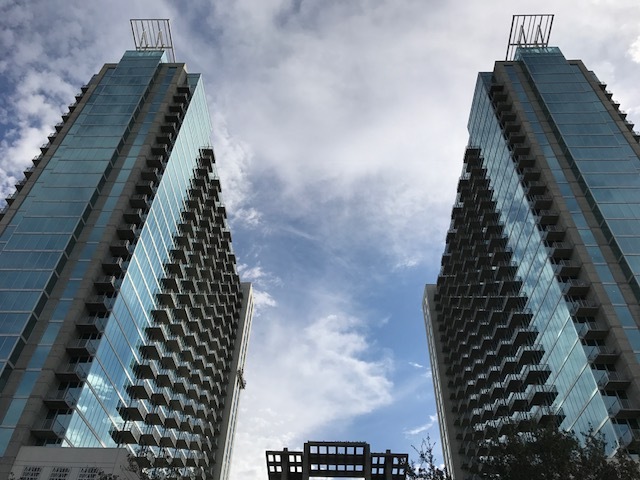 HOUSTON – A partnership of PGIM Real Estate and Hanover Co., a Houston-based multifamily firm acquired the 396-unit Mosaic at Hermann Park tower near the Texas Medical Center and Highway 288. The 29-story building has been rebranded as Hanover Hermann Park. The apartment building, is located near the Hermann Park Golf Course clubhouse and driving range at the corner of McGregor Way and Almeda Road. The former equestrian stables were located nearby at one time. The golf course, founded in 1922, has hundreds of massive oak trees. The apartment tower, which has 20,000-SF of retail space, sits on a 2.3-acre site at 5925 Almeda Road. The twin-tower project, includes one building of individually-owned condo units and a building with rental units. Hanover, led by Murry Bowden, recently completed the Hanover Montrose tower, 3400 Montrose near Westheimer Road. PGIM is the real estate investment arm of Prudential Financial Inc. PGIM recently purchased the LaCenterra at Cinco Ranch mixed-use project developed by Vista near the Grand Parkway on the westside of Houston.